Aaron was born and raised in Friendswood, Texas, just outside of Houston. He was an active member of his church youth group and remembers his experience participating as a mentor on a middle school youth retreat as being particularly formational in his eventual call to ministry. Aaron went on to attend Abilene Christian University, where he earned his B.A. in Youth and Family Ministry in 2014. While a student at Abilene Christian, Aaron spent a semester studying in Oxford, England and traveled throughout Europe. After graduation, Aaron participated in a sports ministry internship in Stellenbosch, South Africa, where he became convicted about his call to enroll in seminary. 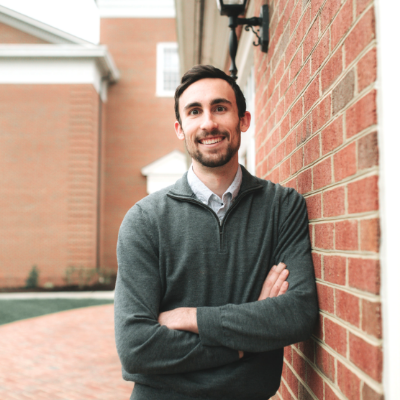 Upon his return to the U.S., Aaron began his studies at George W. Truett Theological Seminary in Waco, TX, where he graduated with his Masters in Divinity, Sports Ministry concentration, in 2018. It is from there, in January of 2019 that Aaron joined the community at HRBC. Aaron is passionate about leading others in relationships that encourage personal growth and transformation. He takes great interest in the process of discipleship and the joy that can come to us in life when our passions are connected to the worship of our Creator. He is married to Lauryn and they live with their two cats, Ollivander and Bellatrix. Together, the Everic’s enjoy traveling and experiencing culture through arts and sport.